Online ticket sales for this event have ended. Please contact the Box Office for more information. 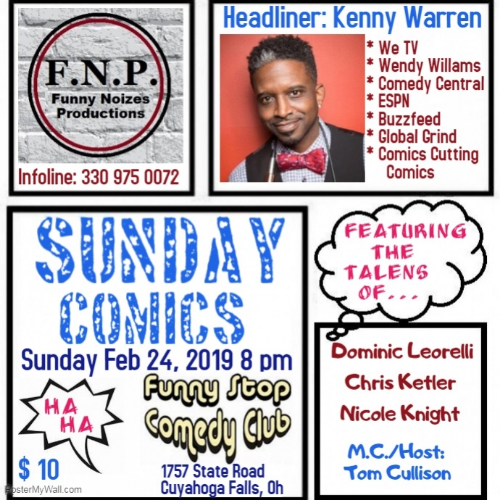 Funny Noizes Productions is pleased to bring to Ohio of one of the funniest and fastest-rising stars in stand-up comedy today when it presents SUNDAY COMICS AT THE FUNNY STOP on Sunday, Feb. 24th. Headliner Kenny Warren hails from Portland, Oregon and now resides in New York City as a stand-up comedian, show producer, entrepreneur, barber, and single father. There is nothing average about the self-coined “™Averageblackman”. Kenny Warren’s original brand, “DSC"(Different Shades of Comedy) encompasses comic book styled super hero, “Just Us League” T-shirts. Mr. Warren provides stage time for NYC’s best and brightest up and coming comedians, most featured on MTV, Comedy Central and your favorite Late Night talk shows, by producing four weekly comedy shows, and two monthly shows. His perseverance and work ethic has established him as a trail blazer in the New York City comedy scene. Kenny’s witty comedic style includes a splash of misdirection. 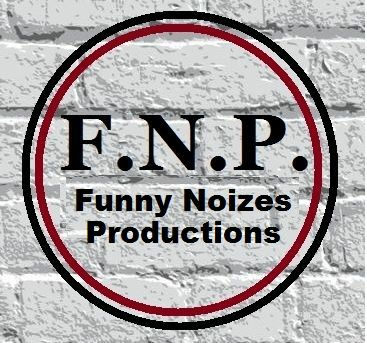 His stage presence has allowed him to perform on some of New York’s legendary stages such as, New York Comedy Club, Gotham Comedy Club, Broadway Comedy Club, and the world renowned Comedy Cellar. He headlined the Hartford Funny Bone in Connecticut.�Kenny’s brand is on the rise. He was featured on Jimmy Martinez + Rip Michaels Experince @ Carolines on Broadway for the New York Comedy Festival 2017, The Daily Show” with Roy Woods, ESPN, TruTV (David Tutera's Show), and The Wendy Williams show. continue to embark on remarkable endeavors in entertainment to become a household name and brand. Kenny's credits include WE tv, The Wendy Williams Show, Comedy Central, ESPN, and more. Feature performer Dominic Leorelli is an Ohio native that’s been working the New York City comedy circuit for the past five years. Guaranteed to bring the house down with his quick snappy wit and rapid fire jokes, it’s easy to see the talent in this young star. Voted most likely to be class clown if he don’t drop out. Raised in a blue collar family, Dominic is now breaking his way into the entertainment industry. His true life stories and unique perspective will definitely leave a memorable impression. Dominic contributed humor as a writer for the late show with Dave Letterman and performs regularly at Caroline’s on Broadway and many other notable venues throughout New York. Chris Ketler (aka The Bitter Dude) who draws from a topsy-turvy life with humor that is easy to relate to and, in the process, funny as hell. Although Ketler is the first to say that his life isn’t quite so bitter nowadays, thanks to the fact that in little more than three years, he’s created a name for himself with recent appearances throughout Ohio, Chicago, Detroit, Nashville, New York City and Orlando. In addition to his work as a comedian and comedy producer, Ketler is an actor, who stars in the upcoming television series, “Below Average Joe.” He also recently wrapped production on Amazon Prime’s crime family drama, “Mafia Ties.” Ketler can also be seen in major films like “White Boy Rick,” starring Mathew McConaughey, “Embrace The Twilight,” and the newly-released “Anhedonia,” starring The Walking Dead’s Emily Kinney. Tonight's very special guest is Nicole Knight. Her name's Nicole, and lately shes been trying to tell some jokes all around N.E. Ohio. Her humor comes from her experiences as she finds her way through life as a struggling female Millennial trying to balance work, love and comedy while finding herself in a big big world. Hosting the evening’s antics is the Master of Ceremonies, WNIR popular radio guru, Tom Cullison, the man with the golden voice (and hair). Please take a moment to like & follow us & our friends. © 2019 330TIX. All rights reserved.